Happy Friday everyone , its the start of the weekend and I have a great book that you all might like . 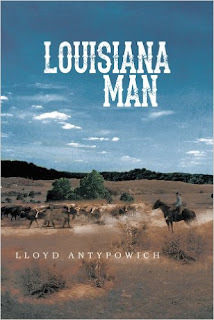 LOUSIIANA MAN by Lloyd Antypowich. "There was never a stronger desire that flows through the veins of a Louisiana man to be a cowboy than in Tom Menzer. At nineteen, he had made a good start to do that, but Pontchartrain, Louisiana, did not seem to be the right place, so he turned his horse west and headed for Texas where the real cowboys came from. The life he lived is nothing more than a harrowing experience. If he made friends with the native Indians, then the white man would hate him, would call him a squaw man, and would tell him that his life was worth nothing more than the average Indian. If he took the side of the white man, then the Indians would look to lift his scalp. Tom was not a killer, and he hated killing. But he found himself wearing a necktie that was just seconds away from taking his life by some soldiers that were paid by a very rich rancher to dispose of him. It was after that he vowed never to be caught by the law. He traveled north to Oklahoma where he made friends with a village of natives. There he hunted and contributed his share of food for the village. The chief rewarded him with his daughter. When she was a little baby still on her mother’s breast, her family was massacred by the natives. She was found crying under some small bushes, and a warrior took her and gave her to the chief whose wife was nursing a young son and nursed her to become a very lovely maiden. The chief later told Tom that his wife was not native, and he had waited a long time to find the right man for his daughter. When the horse thieves tried to kill him and harm his wife and family, it was only then that he used his gun to kill the thieves. Suffering from the buckshot in his back, he had a man at a fort near Calgary dig the pellets out with his hunting knife. You can read on and find out how Tom and Raven Feather learned to love each other in a deep and enduring way. 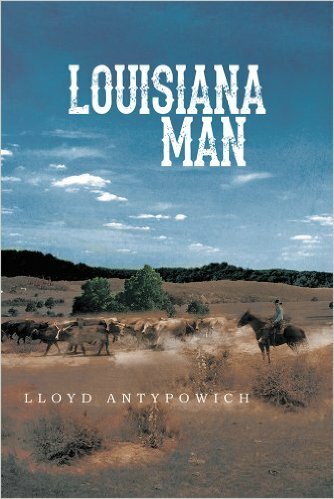 I started reading Louisiana man and got lost in the pages. I was transported back to a time where the west was being won. The cowboys that were coming out west trying to settle the land. The natives that were already established and the wars that went on between them . This book is a fictionalized tale of actual events in the gentleman's life . We go on the adventure that will take us from Oklahoma to Texas and across the border into Canada . Which as I was reading , I really got excited as the author talked about the rodeos in Calgary, Grand Prairie and racing ind Edmonton. I felt very proud of my country as he wrote about them . So lets go back in time and meet Tom. Patchy Mex , Ross and Raven Feather. Best friends that went through so much in their lives . The author has written some pretty interesting characters . They are so diverse but they are best of friends that will help each other out in everything . Tom the main character has just always wanted to start his own ranch and raise horses . He is a no nonsense guy that wants to be friends with everyone. He is sweet but also tough, to do what he does . He goes through so much and comes out the other side stronger and even more determined to survive and thrive. Patchy and Mex are his best friends and they are there for him and help him out. They are hard working characters and they have their moments in the spot light every now and then. They remind me of the old ranch hands you see in the westerns , the guys chewing tobacco and spitting . They actually made me laugh a couple of times . Raven Feather is my favorite character, she is there for Tom and is in love with him, even when he is kind of dense about it . She is his best friend and is willing to do the work that the men do. When she does become Tom's wife, they become like one , doing everything together and helping out the community and the tribes . The characeters were well written and you felt like you were sitting in the saddle right beside them . This would be a book was such a great read, I had a hard time putting it down . I wanted to find out what was going to happen next. To see a book that was also about breaking horses and training them . Well made this country girl feel a giddy inside. The story was well written and the author did his research . Especially reading about the Canadian spots and the rodeos that went with those spots . This book also mad me cry at the end . You honestly don't see that kind of love anymore now a days . I cant wait to read the author's other books . I know my grandfather would of loved this book , if he was alive today to read it . So if you want western adventure check it out .